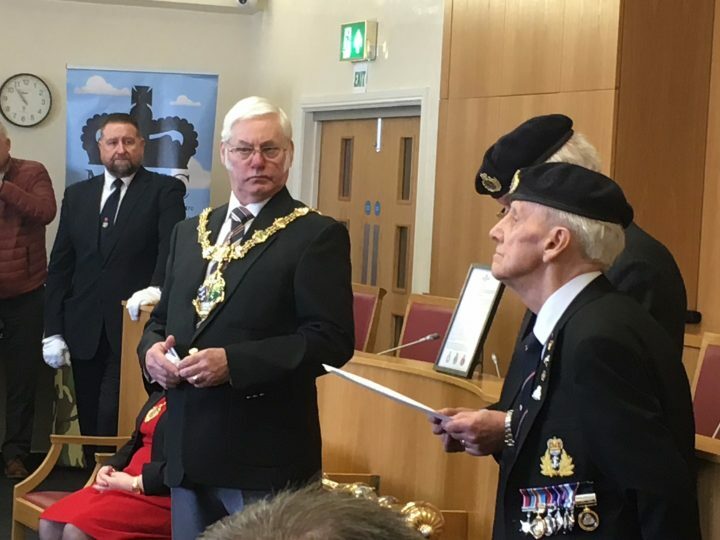 MCVC at The Town Hall …..
MCVC Friday coffee morning last week took place in Rotherham Town Hall following an invite by the Lord Mayor of Rotherham Mr Alan Buckley. We listened to a very informative talk about the Lord Mayors regalia and The Mace. This was the followed by the presentation of the Korean War Medals to Mr Colin Glossop by the Lord Mayor. I think I can speak for all members of the MCVC and say it was a very special moment and I was so pleased to be there to see it and afterwards tea coffee and cake and buns were enjoyed by all. The Lord Mayor and Colin listening to the accreditation on his Korean War Medals. Members of the MCVC enjoying time spent the Rotherham Council Chamber.